One of the big reasons I'm still doing this blog is Brandes Elitch. Brandes writes for Veloce Today, one of my favorite online magazines. I started Just a Car Geek back in 2008. It was invisible for awhile. It would get around 200 hits a day. Maybe. On a good day. Some time in 2009 I checked my email and saw one from Brandes Elitch. I knew his name from Veloce Today and couldn't understand why he would be emailing me. Part of me was afraid to open the email, fearing it would say "Look, man, would you please stop writing about cars... You have no idea what you're doing and you give those of us who do a bad name." But he didn't say that at all. It turned out Brandes liked Just a Car Geek. We exchanged a few emails and he encouraged me to keep writing. In fact, he liked JaCG enough to write about it in Veloce Today. I was stunned. I was flattered. After his article, Just a Car Geek took off. Brandes and I have stayed in touch. It should come as no surprise that Brandes has a nice collection of cars. As you would expect from someone who writes for Veloce Today, he has plenty of French cars, but he also owns an NSU Ro 80 and has a "thing" for old Imperials. Like many things, there is a story behind this car. I am a Citroen collector. I bought my first DS in 1969, which I still have with 50k original miles. I also restored a 5 speed SM. Citroen never sold many cars in the US, but one of their most successful territories was the San Francisco Bay Area. There was a Citroen garage here called Executive Motors, run by 2 guys Donn and Bill. Bill, whose real name was Zvonko Pribanic, became a personal friend because he lived in my town, and was pretty recognizable because he drove a D he had converted into a pickup. Bill, who went by the name "Bratso" was a Croatian who came to the US in the 1950's and became one of the first Citroen mechanics. About ten years ago, he called me and said that we were going to look at a car he had found for sale in Marin County. Well, by then Bratso had retired, so we took the car to Lon Price, who has a Citroen garage in Santa Cruz. Lon confirmed that he would have to replace the entire wiring harness and most of the hydraulic system. Lon kept the car for many months and all the work was done, which cost at least $3000 at the time. Lon can confirm all of this, and you can reach him at Garage Longueville in Santa Cruz (831.476.8395). When Lon finished the work, I drove it home and put it in the garage, where it has been ever since. If you are not a Citroeniste, let me quickly explain what you are looking for when you go looking for a DS. First, the D does not have a traditional body on frame arrangement, nor is it a true monocoque structure. It is really built like a sandwich, which means that if any water gets into the platform, it will cause perforation rust. So the one and only thing you need to know about a D is that it does not have any rust. Enough D's were made (over a million) that all parts are available for the car, either via Western Hemispheres in Santa Cruz, or from suppliers in France, so parts are not a problem, even the tiniest trim part. Now you may be thinking that you would rather have a 4 speed box than the Citromatic, but this is the way the Pallas came, and the truth is that all the factory rally cars had the Citromatic because it shifted faster than the manual box. additional cost. I want to see this car restored sympathetically by someone who can do it now. If you think you are this person, please contact me or call Lon Price, who can be relied on for an honest description. If not, thanks for looking. I believe with a little detailing and a new paint this DS would become once again a beautiful example of this classic Citroen model. Car is located in Sonoma County, CA, 70 miles north of San Francisco. We will deliver on the West Coast for expenses. Price is 6,500, which is less than the cost of the restoration work. Postscript: Bratso passed away 3 years ago, in his early eighties. He devoted probably half his life to maintaining Citroens, and he was a good person. It was an honor to know him. 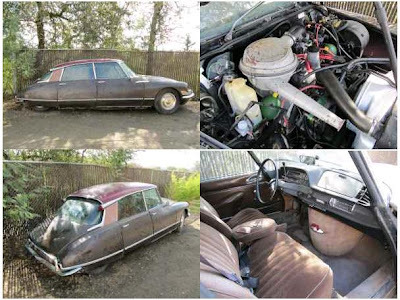 If you're interested in this car - and if you're looking for a Citroen DS, you should be interested in this car - email me and I'll put you in touch with Brandes.